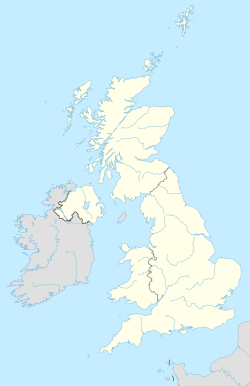 Lenaderg is a small village and townland of 335 acres (136 ha) in County Down, Northern Ireland. It sits on the banks of the River Bann, about two miles from Banbridge and a half mile from the village of Lawrencetown. It is situated in the civil parish of Tullylish and the historic barony of Iveagh Lower, Upper Half. In the 2001 Census it had a population of 261 people. Lenaderg is within the District of Banbridge. Its name is derived from the Irish language. One theory is that it comes from Léana Dhearg meaning "red meadow". However, the townland was historically called Laraderick and Laraghderick, which is believed to be derived from Láithreach Deirce. Milltown Bleach Works at Lenaderg, which was demolished in the mid-20th century, was an important employer. A group of mill workers’ houses still remains. Lenaderg railway station was opened on 1 January 1904, closed to passengers in 1907 and finally closed altogether on 2 May 1955. It was on the line from Scarva to Banbridge. Wikimedia Commons has media related to Lenaderg. ^ a b "Lenaderg". IreAtlas Townlands Database. Retrieved 13 April 2015. ^ "Lenaderg" (PDF). Railscot - Irish Railways. Retrieved 13 April 2015. This page was last edited on 8 March 2017, at 06:30 (UTC).